This Valentines day, I’ll do doing something a little different from the usual. Twenty whole years ago today was the release day for Lemmings, developed by DMA Design and published by Psygnosis. At the time I was in college, doing little freelance jobs for Dave Jones. Converting graphics for our ports of Ballistix and Shadow of the Beast occupied my spare time in the days before I was employed by DMA full-time. My job was to take shiny 32-colour graphics from the Amiga and hack them down into 4-colour character set displayable by the Commodore 64. Wednesday afternoons were free time as far as college was concerned, and that was when I’d tend to visit the office, bringing along the my latest efforts. It was during one of those days that I saw Mike’s famous Lemmings animation for the first time. At one point in the late 90s, I came up with a small demo chapter to show what a History of DMA book might look like (a project which seems more relevant as time progresses; I never would have imagined I’d be getting interviewed by BBC Radio Scotland on this very subject two decades later.) Here’s a remastered version, without all the notes-to-self, or known typos, but with ‘restored’ text. At the time I wrote it, I was still very much influenced by the book Game Over, which was about Nintendo. The first section of the test chapter isn’t directly about Lemmings, but leads into it thematically, and is by no means a comprehensive account of its creation. In particular I haven’t mentioned Gary Timmons, who added much to Mike’s original animation and refined the appearance of the Lemmings themselves. The full story awaits a fresh text and a broader scope. At the time of Blood Money, the output from the young DMA still couldn’t be accused of originality. Both of Dave’s shoot-’em-ups had been inspired by specific arcade machines. In one early demo which he showed to the KACC, Menace displayed waving tentacles on one of the levels. Tentacles of the sort which had been seen in Salamander. A horizontally scrolling game was inevitably going to be the product of Dave’s initial efforts, Salamander being his favourite game; he played it constantly in the Reform Street arcade, Dundee’s largest. The Amiga had custom hardware to provide two layers of scrolling, making it easier (and less CPU-intensive) to display spectacular moving screens. Of the few games available for the Amiga so far, none had made use of this ‘parallax’ scrolling. Dave had a definite philosophy about how to name his products. Out was weird ‘made-up’ titles and in their place was the sort of name which could easily crop up on the news, magazines, or in conversation. Words or phrases which were in the general public consciousness. His thinking was that the title would appear in the normal course of event and people would begin to associate it with ‘that game.’ Hence, Blood Money; a title which was at one stage going to be called IOU. In later years, naming came full circle. The possibility of lawsuits made the use of such easily recognised words too risky and there was a return to made-up names such as ‘Tanktics’ and ‘Kraniaks.’ A name search by a legal firm even saw risk in the use of ‘space station’ in a title, but oddly, not ‘silicon valley.’ At the start of the 90s, however, such concerns never surfaced. Admittedly, most DMA game names were only accorded the status of ‘working titles’ which nevertheless made it intact all the way to release day. It was this spirit in which Lemmings was begun. Scott Johnston joined DMA after responding to an advert in the local paper. Setting something of a trend, he was one in a line of Science Fiction fans; something which his art portfolio clearly showed. On being accepted into the company, he was assigned to another embryonic project: Walker. Despite applying as an artist, he was soon to show that he had programming skills too, often combining them to good effect. Within weeks he had written a program to generate graphics for the Walker’s head, over which fine detail could then be hand-animated. Initially, however, he had to draw small characters for the Walker to stomp over. He elected to make them 16 pixels by 16 in size. Mike saw this and told him that the characters could be at least half the size and still look good. Scott didn’t believe him. “But I’ve seen it before,” Mike insisted. What he’d seen - and later dragged out in evidence - were the characters from Beachhead which had made incredible use of the C64’s limited resolution. Each character had been exquisitely animated. What had caught his attention in particular, was a character throwing a grenade. It was everything that animation should be; smooth, detailed and ignorant of the computer’s limitations. Here, they were brought to life in a grid of a mere 8x8 pixels. Without a copy to hand, though, Mike decided to prove his point over one dinnertime. Ignoring Dave’s ban on eating chips, which stunk out the room, he fired up DPaint and proceeded to create a simple animation with small creatures. One after the other, they walked steadily up a hillside to the top where they - in a macabre sense of humour - got blasted to pieces by a laser, just before they made it to the end of the cliff. Biscuit thought this was hilarious, so much that legend has it that he literally fell off of his chair, laughing. (It was suggested in a later year that DMA needed another reaction like that.) Russell, immortally, said, “Just like lemmings” and followed it with the moment in which Lemmings was truly born. With a laugh he said, “There’s a game in that…” and wondered how it would be possible to go about saving the poor creatures. Dave remembers it differently, with himself playing the role of saying there was a game in the animation. Mike is openly dismissive of that. For his part, Scott didn’t react much when he was shown it later, but sure enough the characters in Walker soon shrank to the same dimensions. 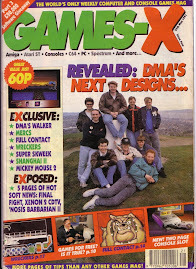 Russell began work on the PC version, purely because time was available to him, several months before the Amiga version got going. The most common PC graphics standard at the time was CGA, which had a fixed - and limited - colour palette; white, green, blue and black. Lemmings had to make use of these colours and that is the reason why Lemmings have green hair. After a while, Russell had to put work aside to focus on converting Ballistix to the PC, at which stage the Amiga became the lead development platform. Mike worked for a time on the C64 version.